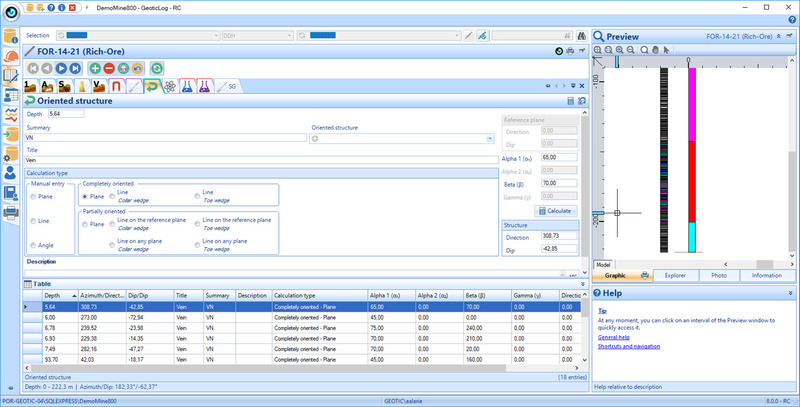 The GeoticLog application is used to input survey information. Its user-friendly interface greatly accelerates data input by allowing users to enter titles, summaries and even typical descriptions with the help of dictionaries. These dictionaries, which are edited by the users themselves, allow data to be validated when input, minimizing the need for subsequent corrections and ensuring exceptional data quality at all times. The information is input and organized in a simple and logical way, making the work even easier. The application also generates personalized reports according to your needs. Similarly, strip logs can be created. The application includes a users’ rights management interface to control data access and make data secure. Data is saved in Access or SQL format and organized in an intuitive schematic diagram, making it easier to produce charts and thematic plans. These databases can then be used by GeoticGraph to create sections and plan views or they can even be exported to other applications. GeoticLog database is directly linked to GeoticMine, which allow to go back and forth easily. Lastly, modules for batch imports/exports, calculating composites, calculating adjusted structures, and QAQC and drilling core photo management integrate with your environment and greatly increase the application’s potential. GEOTIC © 2016 All rights reserved. A realization of TMR Communications: SEO and website creation.